Ashwagandha is a potent herb with a wide variety of applications within Ayurvedic medicine. It is a general tonic and rejuvenator, an aphrodisiac, calmer of the nerves, a mild sedative, and one of the best herbs for the treatment of Vata aggravation. 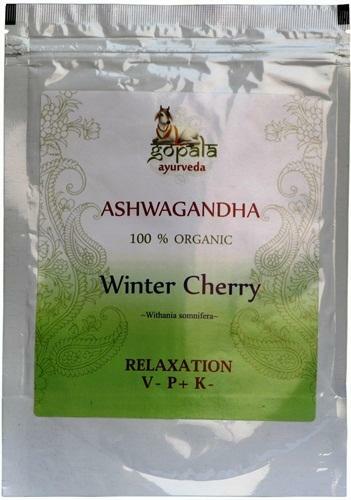 Ashwagandha in Sanskrit means, “that which has the smell of a horse”, and it can impart the strength, vitality, and sexual energy of a horse to one who takes it. As a tonic it is especially revitalizing to the plasma of the blood, bone marrow, muscle tissue, and to reproductive tissue. There are many uses of Ashwagandha for all conditions of weakness or tissue deficiency in children and the elderly, as well as for debility due to chronic diseases, overwork, or lack of sleep as a result of mental exhaustion. The uses of Ashwagandha are many, but for such regenerative purposes milk decoction is best. Milk augments the rejuvenative and nutritive effects of Ashwagandha. For this preparation, Ashwagandha dosage should be about one teaspoon, and to such a decoction one may add raw sugar, honey, pippali (indian long pepper), and basmati rice. This combination inhibits aging and is a catalyst for anabolic processes of the body, that is, processes of tissue growth and regeneration. This preparation is very sattvic and is one of the best for the mind to which it brings clarity and nutrition, calmness, patience, and it promotes a deep, natural and dreamless sleep. A benefit of Ashwagandha steeped in warm milk is that it is good for weak pregnant women, as it helps to stabilize the fetus and the hormones and helps rebuild tissue in the female reproductive organs. Ashwagandha churna is great for tea, but it can also be used to make Ashwagandha extract which is useful for preparing more complex formulations. Recommended Dosage / Suggested Use: 5 grams of the Ashwagandha Root Powder can be taken twice a day in warm milk or water, sweetened with raw sugar. Pack Size: 250g Organic Ashwagandha Root powder packaged in Light Proof Highest Quality Food Grade Zip Lock Pouches for optimum freshness. Convenient and easy to carry around. Side Effects: Ashwagandha has been used safely in India for several centuries and it doesn’t have any side effects at all. However if taken in excessively high doses for extended periods of time high ama and congestion may result. ♥ Herbs certified as Organic by “Control Union Netherland”.